Back to print: Is the Saturday Paper any good? 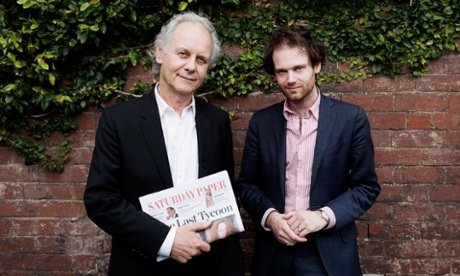 There were more than a few raised eyebrows (and conservative commentators choking on their muesli) when property developer and left-wing publisher Morry Schwartz launched The Saturday Paper roughly six months ago. 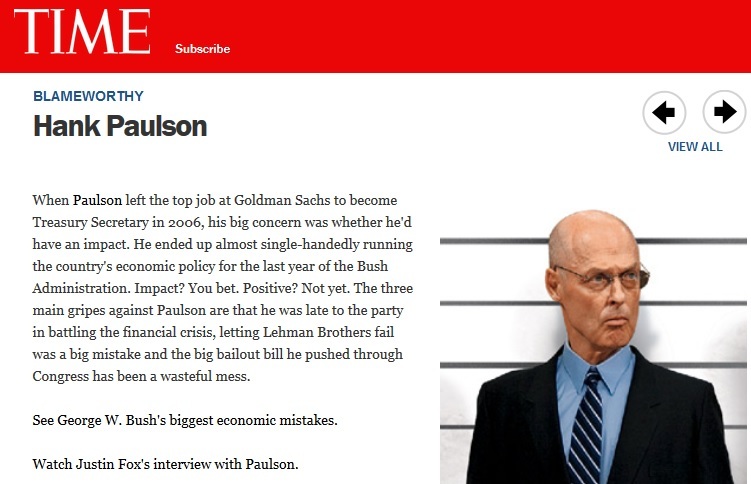 Schwartz, who also publishes features magazine The Monthly and long-form politics bible The Quarterly Essay (and in his spare time runs developer Pan Urban) said in March he saw an opportunity to enter the newspaper space with Fairfax and News Corp Australia “at their weakest”. He said The Saturday Paper would target “readers like me” meaning presumably forward thinking, inner city liberals with good jobs and good educations and that its launch fulfilled a 40 year ambition to have his own newspaper. Last week, I picked up a copy in Readings bookshop on Lygon Street, Carlton and ready it cover to cover. Schwartz has hired an impressive stable of former ABC and Fairfax journalists including Mike Seccombe, who is the paper’s Sydney editor, Richard Ackland, its diarist and legal affairs editor and Helen Razor (Crikey among others) who is the paper’s television and gardening critic. There’s also a whole bunch of “star” freelance writers including David Marr, Guy Rundle and ‘The Slap’ author Chris Tsiolkas. As for the content, there was a lot to admire about the package of stories in the issue I read. Even if you’re political persuasions are right leaning, you’d find a number of articles of interest. The two front page articles were knock-outs. The lead story was about the Essendon drugs saga and ensuing court room battle as told by chief correspondent Martin Mckenzie-Murray. 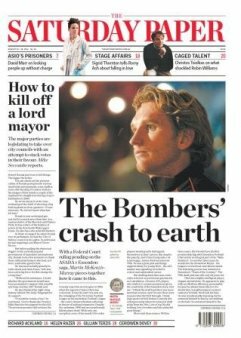 Schwartz has talked about “narrative” journalism and this was the first article I had read on the subject that actually told the story of how James Hird became the Essendon golden boy and his dramatic fall from grace. Having only come to Australia in 2004, I finally understood the hero-worship. The second cover story was about the battle to usurp power from Sydney Lord Mayor Clover Moore. Written by Mike Seccombe, it’s the classic ‘People’ versus “Big Business’ tale with Moore pitched against right-wing adversaries including shock jock Alan Jones and ultra-conservative homophobe the Reverend Fred Niles. It’s a ripping yarn about power, influence and revenge. Canberra journalist Chris Wallace provided thought-provoking analysis of the recent troubles of Federal Treasurer Joe Hockey, arguing convincingly that Hockey is part of a new breed of privileged Liberal politician, who unlike John Howard, are out of touch with the Australian public because they’ve never had a non-political job in their lives or ever known what its like to be a battler. David Marr’s comment piece on asylum seeker rights – centred around a Pakistani shopkeeper thrown into detention following a negative ASIO assessment – was as expected, eloquent and powerful. Guy Rundle did a good job savaging the recent gaffs by government ministers. Another standout was Chris Tsiolkas’s tribute to Robin Williams, which dispensed with the gushing praise, highlighting instead the many bad films Williams made and pointing the finger at Hollywood for lacking the courage to give him roles that showcased his prodigious talent. It’s the kind of observation that alone justifies the $3.50 cover price. Just to prove that The Saturday Paper is not just full of the “usual mawkish left-wing pieties” as The Australian’s editor, Chris Mitchell suggested it would be when it launched, there was also a very interesting profile of Anthony Cappello, Australia’s most successful publisher of ultra conservative books. Thankfully, not everything had a serious tone. Helen Razor wrote hilariously about the challenges and obsessions of those that grow their own tasty tomatoes while basketball star Liz Campage made a good Q&A subject. There was a recipe for shakshouka and observations about the dish from chef Andrew McConnell plus book reviews and other bits and pieces. The cryptic crossword by Mungo MacCallum was beyond my abilities. Romy Ash’s on-set interview with actress Sigrid Thornton was pretentious, dull, waffly and full of self-important actorly observations that made you wince while Richard Ackland’s diary piece was too insidery and obscure to be of any interest to this humble reader. Overall, I give The Saturday Paper 8/10 for the quality of the writing, choice and range of subjects and knowledge imparted – or 6.5/10 if you’re a conservative reader. Death by @Twitter: Do my tweets matter that much? A strange thing happened to me on Twitter a little while ago. I think the Abbott govt would have made more of an effort to help Peter Greste if he worked for News Corp. The tweet was in bad taste, but I had blundered even further by being completely unaware that the verdict had just been handed out in a Cairo kangaroo court. It stayed up a couple of hours while I was out at the movies. When I returned, my Twitter notification box was lit up: half a dozen people had seen my remark and hurled abuse at me – via tweets calling me an insensitive so and so. Others had retweeted their condemnation of my tweet. The wheels – I thought – were in motion. For a moment, I was in a blind panic. 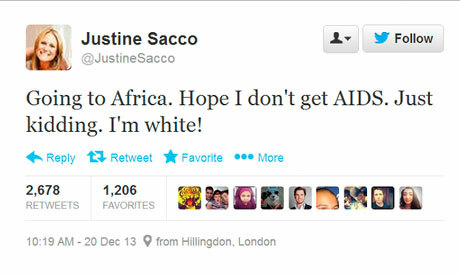 Would I suffer the fate of Justine Sacco, the PR executive who tweeted about going Africa and getting AIDS and become a social media sensation (for all the wrong reasons) and get sacked? In a cold sweat, I frantically deleted the tweet and tweeted my apologies to the most incensed in the Twitter-sphere (Complete strangers actually). We all made up – and life went on. Looking back on it now, I can’t decide if I completely over-reacted or on the other hand – had defused a ticking time bomb. I think perhaps the former: My tweet was not nearly provocative enough and it was neither racist, sexist or xenophobic, the kind of tweets that really land you in to trouble. In fact, now I kind of wish I’d left it up – just to see what might have happened. Andy Warhol famously predicted in 1968 that in the future, everyone would get their 15 minutes of fame. He probably never thought that so many people would achieve it via social media or reality TV? Had I missed out on mine? Certain things remind me of my Jewish roots. Some bring me closer, other repel me. Make me want to run a mile. 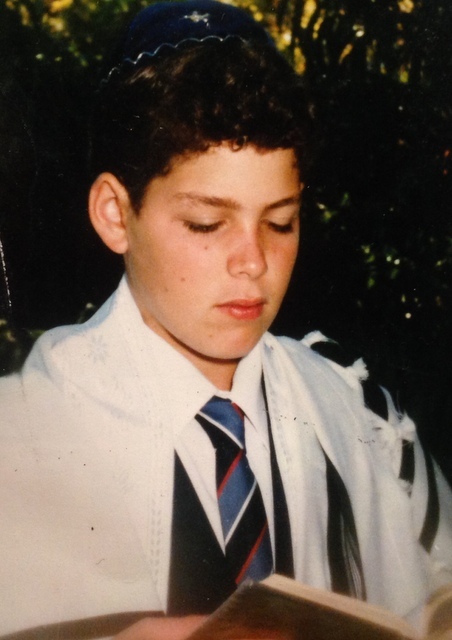 Like watching Manny Wax talk about the sexual abuse he suffered at the hands of David Cyprus, a security guard at the Yeshiva College Melbourne, the subsequent community cover up and shameful treatment of Manny’s family by their supposed friends. These things repel. They push me away. Then I see a man like Zephaniah Wax, Manny’s father, an orthodox Jew with a modern-day understanding of the world, who is kind, thoughtful and funny, whom I instantly admire and like, a man I would love to discuss the philosophies of life with over a meal. He is nothing like the orthodox woman who tought me at cheder (Jewish studies I attended in the afternoon while I was at primary school) who told me I should try not associate with non-Jewish people. Or the awful history teacher at high school, who tried to make us learn to draw the map of Israel by heart. She repelled me as did the forced morning prayer, the constant yelling at kids who didn’t pray and the shovelling of religion and zionism down our throats. The truth is being Jewish is complicated. It’s probably why Woody Allen depicts his characters – primarily New York jews – as guilt-ridden, questioning, uncomfortable people. Never quite at home in their own skins. I love those characters and identify with them. My own admission is that I have willingly and easily slipped the yolk of my religion. I’ve married out the faith, I eat what I like, I never attend synagogue and don’t observe the sabbath or any of the festivals. I am very much a secular Jew. It was my mother who instilled in me my Jewish identity. She got it from her father, my grandfather Harry, who died – on of all days – on the eve of Yom Kippur, the holiest day in the Jewish calendar, the Day of Atonement. It shook me when he died on that very day. Having been told endlessly that Yom Kippur was the day when you were inscribed either in the book of life or the book of death, his passing felt huge and momentous. In my mind, I always pictured Yom Kippur as the hand of God writing names in one of two enormous, leather-bound books somewhere up above clouds. On the cover of one was written “LIFE” on the other “DEATH”. Harry, who we called ‘Zayda’ (Yiddish for ‘Grandfather’) and his son, my Uncle Sydney, who we all called ‘Uncle Yoel’ were the religious centre of our extended family when we grew up in South Africa in the 1970s, 80s and 90s. Zayda was a distant, but kind man with big watery eyes made huge behind thick glasses, a bald head always covered with a kippah and a bow-legged walk. He was an old man from my earliest memories. Zayda was the impetus for us observing the rituals of the Sabbath and the festivals. Before Passover, he would hide ‘chametz’ (pieces of bread) around the house and then we would walk behind him in the dark as he tried to remember where he hid them. Zaydah would hold a candle and a little shovel he’d made from cardboard and using a feather, sweep up the “unleavened bread” in ritual cleansing of the house of bread before it was filled with boxes of Matzoh. My sister, brother and I could hardly keep a straight face as we marched around the house searching for bread. My grandfather was never amused by our snorting. Many months later, we’d find stale pieces of bread on bookshelves or somewhere else Zaydah had forgotten about. Like many Jews of his era, a favourite pastime was reading the obituaries in The Star newspaper in the afternoon to see who had died. This he did with a magnifying glass, hunched over the paper. Having come to South Africa from Russia where he ran a concession store on the mines, I think he had endured a tough life. He had a sad face and suffered the loss of wife Lily, my ‘bobba’ when she passed away suddenly many years before I was born. I was very close to my Uncle Yoel – a slim man with a neatly trimmed black beard, always full of ideas, patient, kind and well liked by all who knew him. I used to go to his flat in Hillbrow (and inner city Johannesburg suburb that has since fallen on hard times), where we studied the portion of the Torah I was to read for my Bar Mitzvah. I’d come to his flat on Sunday mornings to study, but we also talked about cricket and other things.I am not quite sure what my Uncle did for a living, but for a long time he sold a course of motivational tapes from the ‘Success Motivation International‘ – SMI as I called it – that created a program for setting and achieving goals. He gave me a set of tapes and we would also sit in his flat planning my goals and how I would achieve them. One of them was to be a good Bar Mitzvah boy, which I achieved. After my Uncle Yoel married his wife Esher – a native of Chicago with a big beaming smile who seemed to find everything I said funny – and started to have children they moved to a big house in Yeoville, an predominantly orthodox Jewish neighbourhood of square brick houses and shady trees reminiscent back then of the Melbourne suburb of Balaclava with its kosher cafes, Jewish institutions and synagogues. Here our family and my Uncle’s family would gather on Friday nights for the Shabbot (Sabbath) meal. We would sing songs in hebrew and say the prayers and then feast in the traditional Jewish way: by overeating. First would come the chopped liver piled high on challah (platted loaves of bread topped with sesame seeds) on to which I heaped horse-radish or mustard. This was followed by chicken soup, a broth that contained soft pieces of chicken, necks and stomachs and sometimes chicken feet followed by a main course of chicken or meat or both, roast vegetables, kugel (potato pudding) and salads. Dessert was non-dairy chocolate mousse which my mother made with something called Orley Whip, a staple of every Jewish household in Johannesburg. A couple of years later my Uncle Yoel emigrated with his family to an othordox neighbourhood of Chicago. Over the years, as I have drifted further and further away from Judaism, we have sadly lost touch and lost that close bond we had when I was a young boy and teenager. The last time I saw him was at my brother’s wedding in Miami in 2010 and before that it had been many, many years since we had seen each other. Over the years, I have shaken off layer upon layer of my Jewish skin. But there are many layers. I have remained – at heart – a proud, non-observant Jew. My core Jewishness remains and deeper than traditional foods, the jokes, anxiety and guilt. Sometimes I feel a longing to sit in synagogue and sing some of the familiar Friday night songs. On the odd occasion I get invited for a Friday night meal or to celebrate one of the festivals, it’s a special treat. Sometimes I find myself humming the tunes I used to sing in synagogue. It was a sad, but also defiant moment on the ABC’s Compass show that aired the story of Manny Wax when Manny’s father Zephaniah and his wife are seen sitting alone at their vast dinner table, because their own family and community have cast them out. It takes me back to those big Friday night dinners in Berea, that I remember now so clearly, but yhat are also so distant. There’s the enormous meal before us. I’m calling on someone to pass me the ‘chrain’ (horse-radish) to spread on my chopped liver. There is herring and kichel (sweet Israeli crackers). The two families are gathered together. My Zayda is there eating slowly. He is very old and struggling to hear what everyone is talking about. My Uncle Yoel is discussing cricket or asking me about my week at school and the food keeps coming. The house is suffused with the smell of chicken and potato pudding. Wax drips down the shabbat candles, which flicker and burn on a silver tray. Later we ‘bench’ – sing prayers of thanks for our meal – and make our way home by car through quiet Friday night streets of Yeoville and Observatory. These were things that bound us together back then and are a layer that I keep beneath my skin. Woody Allen’s ‘To Rome with Love’ is a gorgeous tribute to the “eternal city” and a feast for the eyes. The Coliseum, the Trevi Fountain, the Roman Forum, the Spanish Steps, quiet cobbled back streets and rooftop panoramas are the backdrops to four off-beat stories about people caught up in various adventures and mis-adventures in Rome. 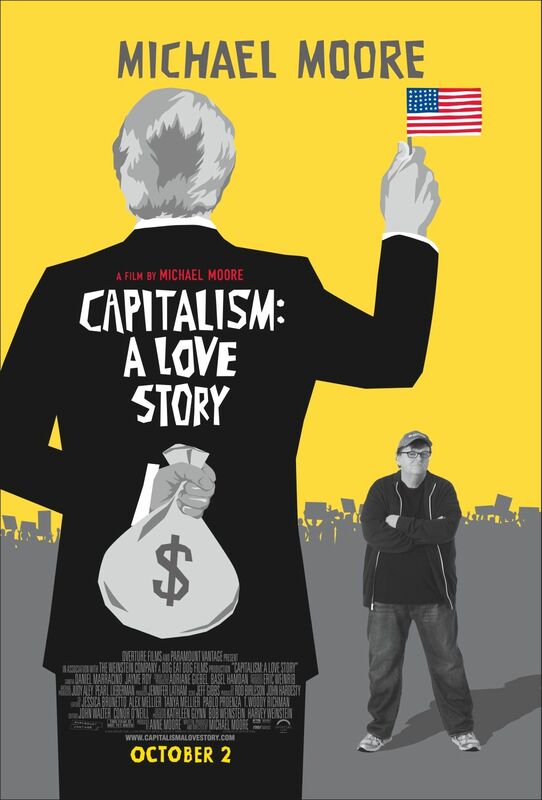 While not a classic among the director’s huge body of work (no less than 50 movies), it is filled with enough classic “Woody Allen” moments to make it one I would recommend to fans. Jerry: “You know, you married a very bright guy. I got a 150/160 IQ. There are also some very funny moments as when Giancarlo (played by real Italian opera singer Fabio Armiliato) – the soon to be father-in-law of Jerry’s daughter Hayley – is wheeled on stage in a production of the opera Pagliacci singing in a portable shower while he soaps himself (I am sure you can work out the reason for yourself). Jerry: I see New York. I see Vienna Opera House. I see Paris. Phyllis: All in the shower? Jerry: Yes. They love it that he sings in the shower. They identify. You know, he’s going to be the most popular opera singer in the world. from first to last gesture. Mr. Pisanello is having his hair cut. – Look, just a trim – He opted for only a trim. There’s also a sensational performance by Penelope Cruz as Anna a gorgeous, buxom prostitute and great cameos by Italian actors Rosa Di Brigida and Antonio Albanese among others. Watching ‘To Rome with Love’ took me back to my last visit to the city, in 2010, when I was backpacking around the world with my wife. Rome felt nothing like the care free, enchanting city depicted by Woody Allen. Our few days in the “infernal city” had been a disaster from beginning to end starting from nearly getting run over by Italians in small cars as we hiked down a narrow road, in desperation, trying to find our budget hotel on the edge of town. After that ordeal, we spent our days fighting our way through traffic jams of tourists at every famous site and on every crowded piazza. Even getting a simple scoop of gelato meant standing in a long line. Worse was the sun which pounded down relentlessly while Rome seemed to offer no shade or escape from the heat. Everything was too expensive, the subways and trains were like ovens and we felt like the only two fools in Rome without a penny to scratch between us. We were glad to leave. This was nothing like my experience of Rome about eight years prior, when I visited with friends. I was living in London at the time and money was less of an issue. We hired a large rooftop flat with sweeping views over the city. We ate delicious pizza and pasta al fresco on big piazzas with the locals. We drank lots of Italian red wine, sipped cappuccinos and shots of Amaretto liquer and watched the sun sink below the white church domes from our mock-castle in the sky. At least that’s how I remember it! We visited all the sites; stared up at the ceiling of the Sistine Chapel and explored countless old churches. We went walking along the Appian Way to find the ancient catacombs and took naps in parks in the afternoons. I remembered getting lost outside the Altare della Patria, the white marble national monument known as the ‘wedding cake’ on our way to find some famous site just as Hayley (Alison Pill) does at the start of the movie, only for Michelangelo (Flavio Parenti) to show her the way. When John (an architect played by Alec Baldwin) is drinking a glass of wine with his wife and friends on the piazza, I remembered sitting at an outside table in front of the Pantheon, ordering a ‘prosciutto’ pizza only for the waiter, confused by my poor pronunciation to bring me a ‘bruschetta’ – much to the amusement of my friends. 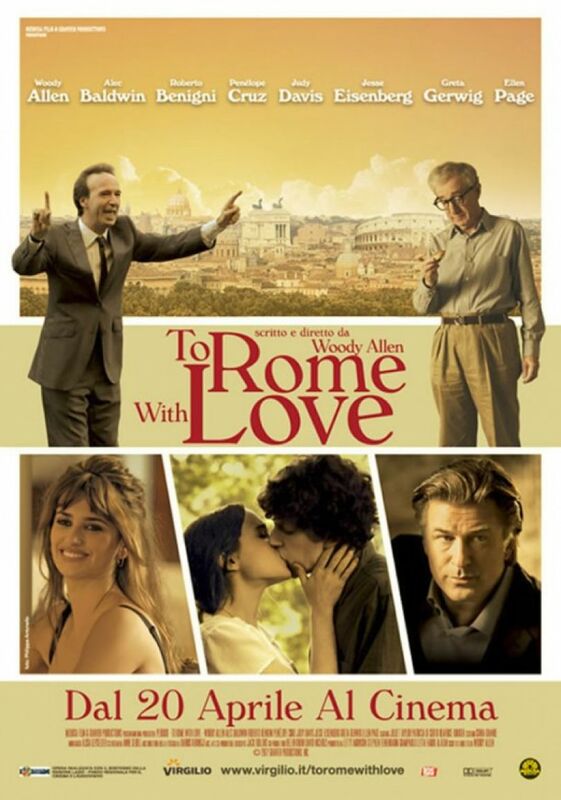 ‘To Rome with Love’ is not Woody Allen’s greatest film or even a great one, but as a homage to Rome, it is practically flawless. It reminded me of all the reasons I loved Rome the first time. 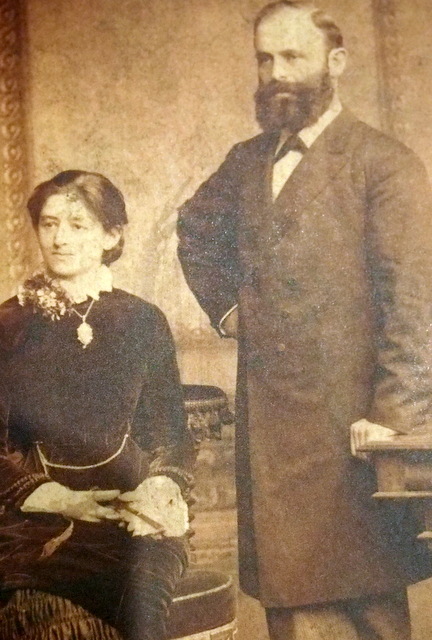 This is a picture of my great great grandfather Heinrich Gimkiewicz (with impressive beard) and his wife Helene taken in Berlin in 1881. I have come to know a little about Heinrich through a self-published book by a cousin, Keith Kaye, a urologist who lives in Minneapolis. Keith translated and published the diary Heinrich kept while serving as a non-commissioned officer during the Franco-Prussian war, a largely forgotten but bloody dispute that took place in Western Europe between July 1870 and May 1871, won by Prussia thus unifying the various German states. The diary was bequeathed to the University of the Witwatersrand in Johannesburg by Heinrich’s granddaughter Helga, It was here that I studied various degrees between 1992 and 1998, emerging, finally with a Bachelor of Arts in 1996 and a Post-Graduate Diploma in Management in 1998. All that time, I had no idea a diary was kept by the University library detailing the daily marches, battles and ruminations of my distant paternal descendent. When I began reading the translated diary entries I was at first bored. Heinrich details his movements from one town to the next, the long marches or train rides, complaints about the cold, waiting around for orders and details of the various civilian billets where he stayed in occupied French towns. The names of towns and army commanders meant very little to me. But as I read and persevered, I found Heinrich to grow more interesting and to see things in his personality that reminded me of myself. It became apparent to me that my great great grandfather enjoyed a drink, preferably an alcoholic one (as I do) and sometimes drank until he was “tipsy”. It is quite nice here, there are lots of apples; the people make a pleasant drink out of them. It is available in quantity, and we like it very much, there being no wine. I go and get my baggage, we prepare our meals and sit together until 10pm, having a good time. There is enough cider, each day we drink a considerable amount. He was also fond of exploring the towns that he visited and had an appreciation of architecture, food and the hospitality and the customs of local French people, even if they were the ‘enemy’. However, unruly Frenchmen are not tolerated and one, he reluctantly admits to slapping. It happens on February 16, towards the end of the war when he is billeted in the home of a cotton manufacturer. Heinrich writes that at 6.30pm he eats dinner with his landlord, “who is a very friendly man” then goes out again “this time on a less moral path”. We want to have a look at a French brothel. There are many here. The first one is the Maison Stephan, which is high-class. The second one is a normal one. We return at 11pm. No description is given of what he did for four hours, but we can guess. His fondness for the ladies reveals itself on a number of occasions with glowing descriptions of local landladys (one is”an aristocratic woman called Madam de Savers” who is “very friendly”) and the daughter of one of his landlords. Rouen was a special place for Heinrich in the war. He writes of its bustling life after the armistice is declared and that “in all the places and in all the cafes it now becomes obvious that this beautiful city belongs among the greatest in France”. I would whole heartedly agree. My wife and I visited Rouen in the summer of 2010, staying in a little shoebox apartment above shops on the main road. Our landlord was a small, dark-skinned moustached man, who spoke not a word of English. We cooked tinned Cassoulet on a portable gas burner in the evening after exploring the exquisite, historic town in the day. Now, I wonder, if I tread on the same cobbled stones as Heinrich did all those years ago as he explored the various districts and drunk in its cafes and restaurants. Heinrich also writes intriguingly of the Yom Kippur service for Jewish soldiers, the holiest day in the Jewish calendar. A proud Prussian man willing to die for his country, Heinrich could not have known that this war, which unified Germany, would create some of the circumstances that led to the First World War in 1914 and later the Second World War, where German Jews were betrayed and murdered in their millions by their homeland. …all in all there were 400 men of our denomination there. 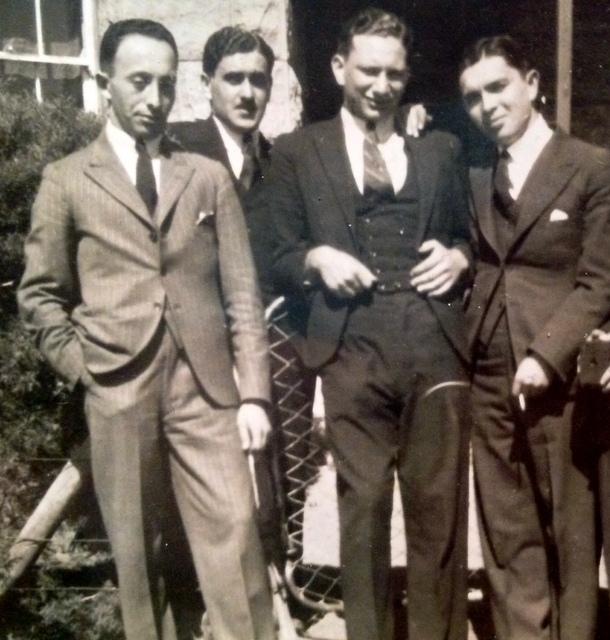 It was Rabbi Blumenstein who came especially from Mannheim…it was moving. Most of us had probably never prayed as intensely as we did today. Now we are to see the ocean. We are led there one platoon after the other, it is a gorgeous view…with its huge waves…a clear difference from our eastern sea. This mighty sea with its waves which exist in such height only here, surrounded by high white chalk cliffs is really indescribable and unforgettable. This great view truly compensates for all our strains of the last days and we are grateful to our captain who kept his promise. With the war over, Heinrich returned Berlin and married Helene 10 years later. They had four children. The family move to South Africa in 1899 was most likely sparked by a wave of anti-Semitism surging through Europe at the time and the prospect of making one’s fortune amid the gold fields of the Witwatersrand. Heinrich’s daughter Else would later marry an Austrian-born geologist and mining engineer called Bruno Schlesinger in 1907 and I would emerge into the world in 1973, a chubby child with a curly mop of hair to carry on the Schlesinger name. 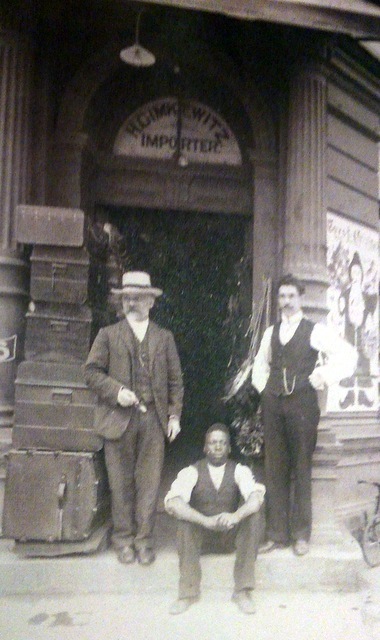 Heinrich ran a toy shop in the centre of Johannesburg with merchandise imported from Germany. A photo outside the store shows him to be a dapper dresser in three-piece suit and hat, bearded with fob chain dangling from waist coat. Sadly, anti-German feeling in 1915 following the sinking of the British ocean liner the Lusitania forced Heinrich and his family into veritable hiding as mobs attacked anyone of German descent. Being unable to import German goods, he lost most of his customers. Heinrich died in 1922 aged 75, 10 days after his wife Helene apparently of a broken heart. They are both buried in Johannesburg’s Brixton Cemetery. – I think I would have enjoyed sharing a glass of wine with him. Or maybe some Cider.